Chances are, you’ve probably struggled with acne at some point in your life (if you haven’t, you’re lucky). It’s not always easy to know the right way to treat it. Especially if you don’t know what’s causing it. Is it hormonal? Is it diet related? Is it related to your heart or lungs? Figuring out what your acne means is the first step. 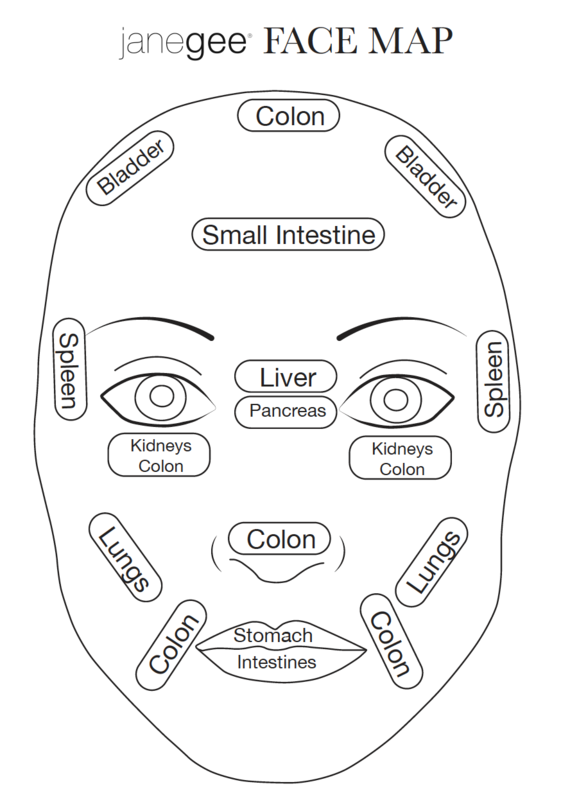 Your face is a window into your digestive system. Where your breakouts are located tells us so much about your skin and body. According to the five element theory in Chinese Medicine, your skin is telling us your innermost secrets. Food sensitivities can cause inflammatory conditions on the surface of your skin. I have always believed that you cannot ignore the state of your digestive system and what you feed yourself! It is so important to keep your gut healthy and balanced. Keeping your gut healthy and balanced is vital for good health. The microbiome on your face and in your gut are mirrors of each other. You cannot treat the surface of the skin and ignore what you are putting into your body. 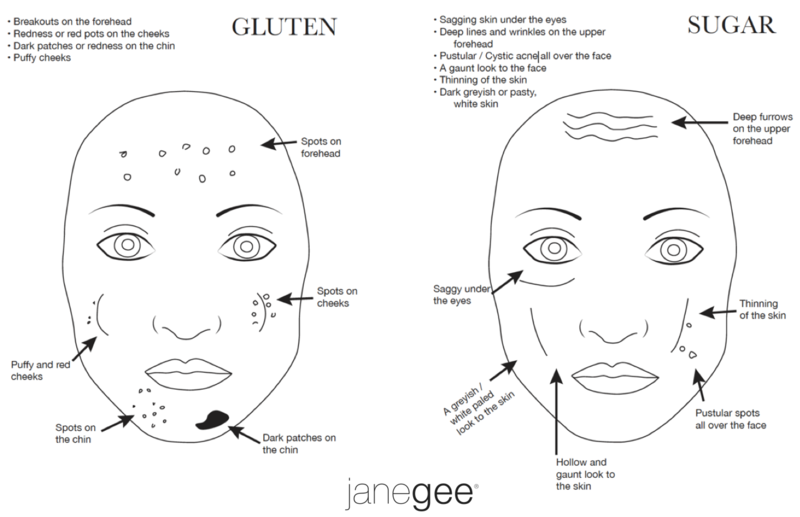 Your skin could resemble one of the following images as a result of consuming too much of a certain food group. The skincare market is saturated with so many different products and brands, it makes finding the right products exhausting and frustrating. Sometimes products work for a while and then all of a sudden stop. You’re left on merry go round searching for the perfect solution in a pill or a bottle. Chemicals - Despite what other brands might be telling you, harsh chemicals are NOT going to help. Scrubs, Peels, and Exfoliants -These products will strip the oil in your skin, stretch your pores, break capillaries, and cause your skin to lose elasticity and age quicker. You will just end up causing unnecessary stress on your skin. Scrub the floor not your face. Cleanser -I cannot begin to tell you how important this is. Finding the right cleanser is vital in order to keep your acid mantle intact. The wrong cleanser can destroy it, which sets you up for more problems. Make sure you’re not using a surfactant, sudsy type cleanser, it will make your skin oilier! Moisturizer -Not all skins need a separate product to moisturize. Your skin may feel dry but perhaps it’s only the surface and not a ‘true dry’ skin. If your cleanser is too harsh it will strip your skin causing the surface to dry and consequently trap oil underneath. You then think you need a moisturizer for dry skin and end up over feeding your skin with rich product- clogging it up even more. The following products are great for acne prone skin. They will help treat your acne and balance your skin to prevent future breakouts. 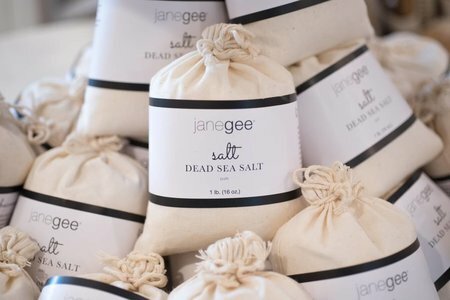 All janegee products have been developed to solve someone’s skin concern. 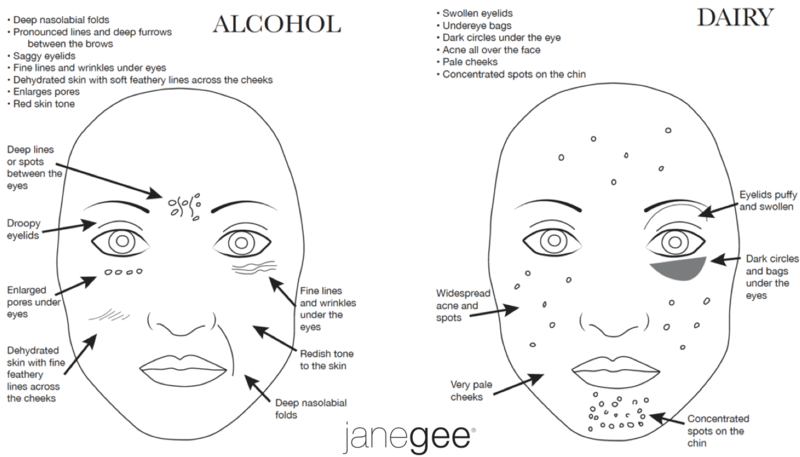 Our approach with acne is to cleanse without drying, maintain the acid mantle, hydrate, and detox. Made for an employee who had severe cystic acne, Clear Skin is a blend of natural oils designed to help balance the pH of your skin and regulate oil production. Jojoba Oil has the same properties as the sebum (oil) we produce on our skin. It also helps dissolve clogged pores, making exfoliating unnecessary – your skin will do it on its own! Tamanu and Helichrysum both help heal scarring. Palmarosa is great for treating blackheads and other acne. Carrot Seed Oil has anti-aging properties, so you’re keeping your skin youthful and glowing while treating your acne. Coconut Oil is naturally antibacterial and has a natural SPF of 10. Clear Skin is so simple to use too. 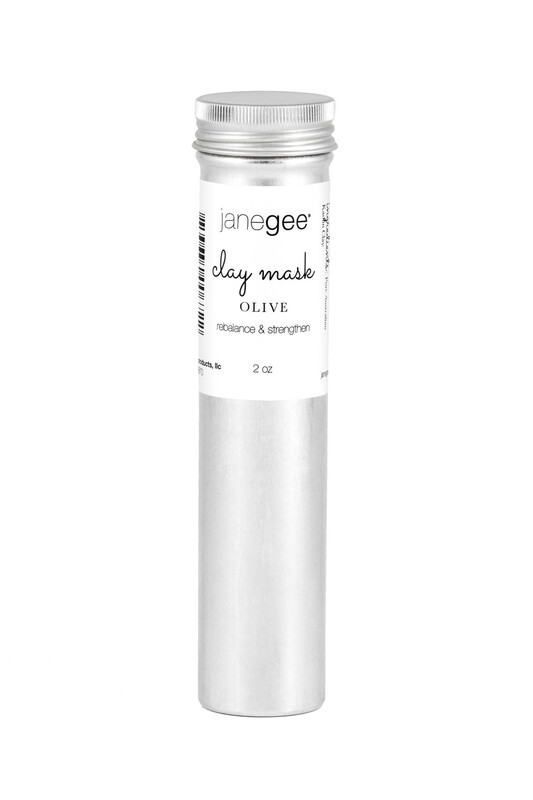 Simply massage a couple drops of the oil into your skin, rinse off with a face cloth (try one of our janegee antibacterial linen face cloths for best results), pat your face dry then massage a couple more drops into your skin as a moisturizer. 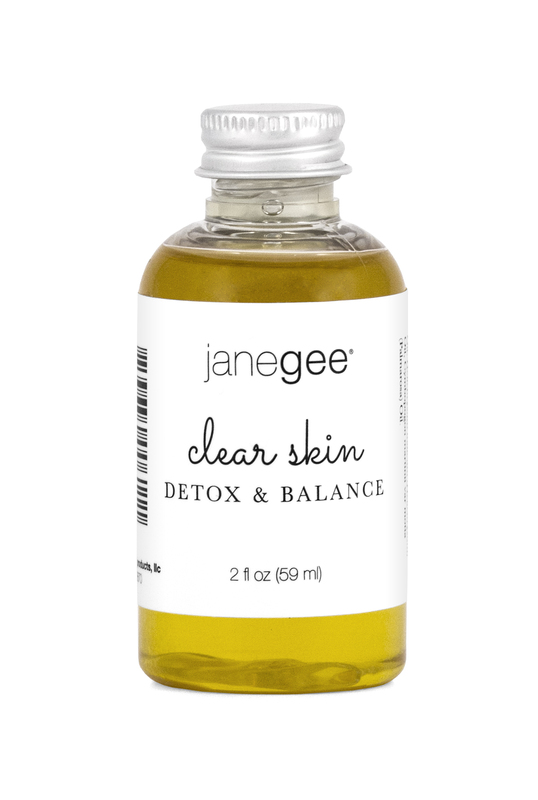 The Balancing Oils are a combination of yin and yang oils that are designed to balance any redness in your skin. Yin Oil is made with a blend of cooling oils which you can apply on any red areas of your face. 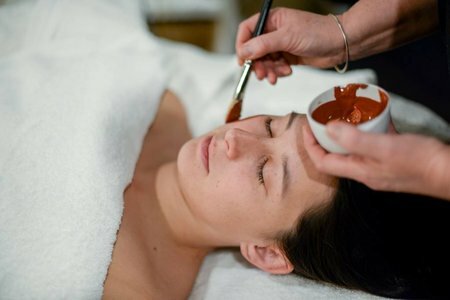 Yin will calm and strengthen the capillary walls, and ease and tone down the redness. 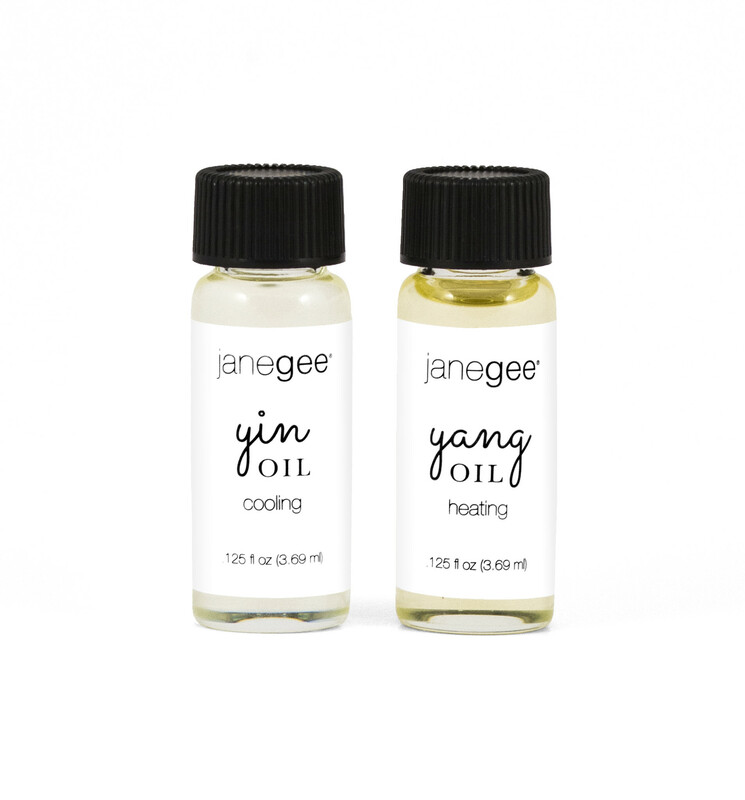 Yang Oil is a heating oil which is designed to be applied to areas of your skin that doesn’t have redness. Yang oil will stimulate the blood to the cells (this is where the nutrition is) and the lymph to take away and drain waste from the cells. Balancing Oils do just that - they balance out the energy in the skin. Making it healthier and more vibrant. 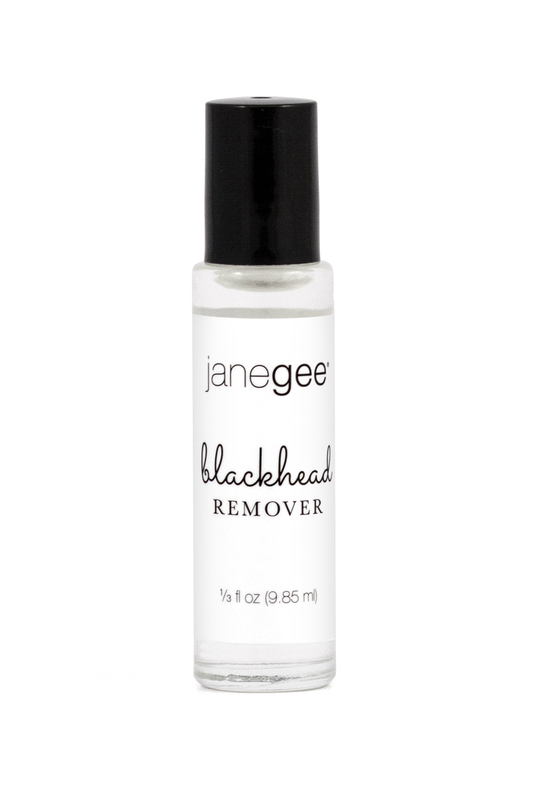 Blackhead Remover dissolves clogged pores, for both whiteheads and blackheads. It can be used in the morning and/or at night, and works great for all types of acne. 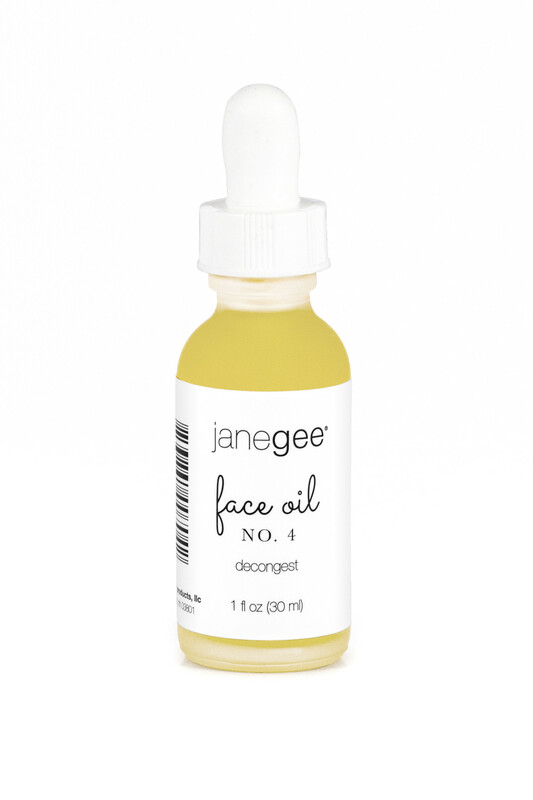 Face Oil No. 4 was created specifically for oily, acne skin. This oil is rich in vitamins making it an essential in your routine. It will also help add moisture for drier skin types. Apply a small amount all over your face after cleansing. Follow up with your moisturizer. 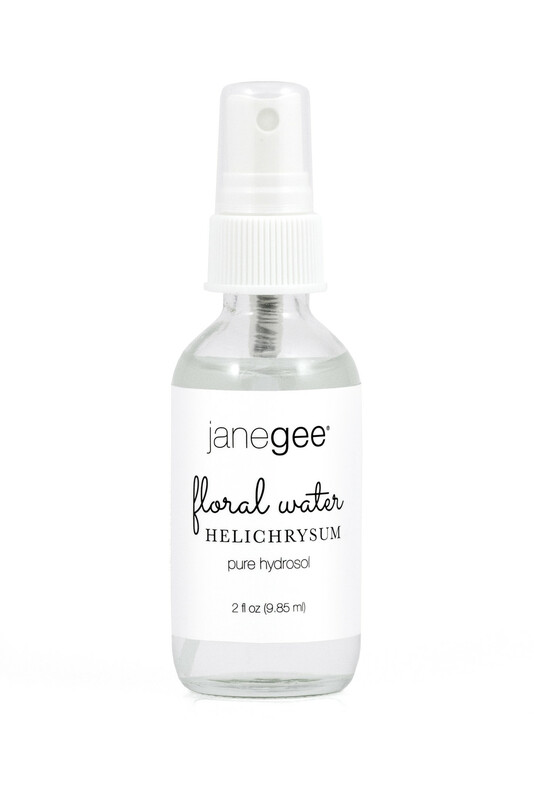 janegee Floral Waters are made with 100% hydrosol which means you get the benefits from the whole plant. They are great in place of a toner, to set makeup, or just as a refreshing facial spritz. They feel great on a hot summer day and are so soothing after a sweaty workout. Keep one in your bag and spray throughout the day if your skin needs a boost. Helichrysum is our favorite helping for acne and acne scarring, but make sure to check out all 4 scents next time you’re in the store! This mineral rich clay comes from Australia. Olive Clay is the strongest for detoxifying and is beneficial on acne-prone and oily skin. The minerals help to rebalance oil flow, strengthen the skin, and aid in the repair of scars. When you add water to a natural clay you electrically charge it. Clay will draw out impurities, dead bacteria, and heavy metals. Tip: mix your Olive Clay with our Helichrysum Floral Water for ultimate results. Acne is such a big subject, but not as scary as you might imagine. Getting your skin to look clear and beautiful naturally doesn’t have to be difficult. With a simple daily routine and an understanding of your diet, you can be on your way to smooth, glowing skin. You can clear up your acne and (in some cases) eradicate scarring, all with diet and good, healthy, simple products.